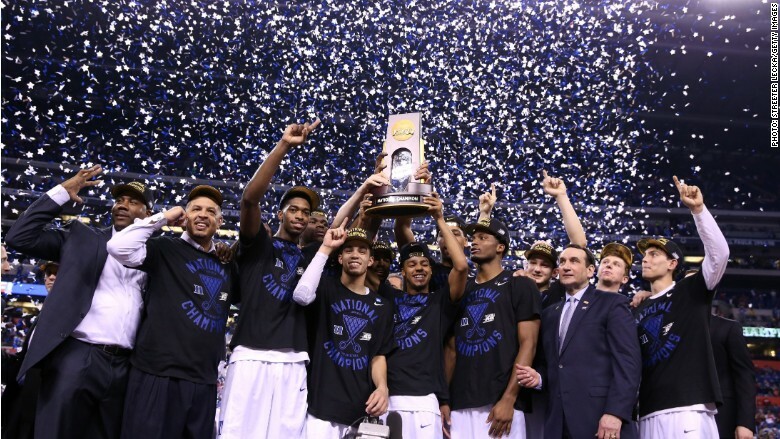 Duke edged out Wisconsin for its fifth national title. March turned out to be a mad month both on the basketball court and for TV ratings. Coverage of the 2015 NCAA men's college basketball tournament scored the highest viewership in 22 years, averaging 11.3 million total viewers, according to Nielsen. The tournament's final game, the Duke/Wisconsin National Championship, netted the highest rating for a NCAA title game in 18 years. An average of 28.3 million total viewers tuned in to watch the Duke Blue Devils capture its 5th national championship by defeating the Wisconsin Badgers 68 to 63. The heavily contested game peaked in its final moments with an average of 33.4 million viewers tuning in to see Duke take the crown. It was an unexpected win -- only 9.3% of the 11.5 million ESPN.com brackets picked Duke to win it all. The big ratings are good news for the many companies that bought ad time during the tournament. For the live game broadcasts, 201 brands including companies like AT&T (T), Buick, and Capital One (COF) accounted for $1.07 billion in TV ad revenue during March Madness, according to ispot.tv, a platform that tracks TV ads in real time. The tournament -- which started in mid-March -- was broadcast on CBS (CBS), TBS, TNT, and truTV. Back in 2011, Turner Sports (which is owned by Time Warner (TWX), which also owns this website) and CBS paid billions for the rights to the games through 2024. March Madness also had a strong showing online. NCAA March Madness Live, the tournament's streaming app, set several records, one of which was generating 80.7 million live video streams during this year's event. The app also set a record for Monday's National Championship with 3.4 million live video streams. On social media, March Madness had 350 million impressions across Facebook (FB) and Twitter (TWTR) -- a 45% increase over 2014. One of the more memorable moments was Villanova's "Sad Piccolo Player," who became a viral meme.